Notes from the Toybox: How do you explain the death of a loved one to a five year old? How do you explain the death of a loved one to a five year old? The "Heavenly Pilots" sequence in Hayao Mizayaki's sublime "Porco Rosso"
Our great uncle passed away a fortnight ago at the ripe old age of 92. Bill was much loved by the whole family, particularly Princess C who found him funny and charming, and always good to talk to (some older members of the family see children as a bit loud and a bit of a pest but he never did). Today is his funeral and we wondered how we'd broach the subject with Princess C. She would know something was wrong as I don't usually pick her up from school today, Mummy does but Mummy is at the Funeral. The eerie thing is that she seems to have known all along. When my wife first heard the news on the telephone, Princess C was in the office with her and as my wife put the phone down, she came over to give her a big cuddle. She could sense something was wrong. Since then, she's mentioned death and growing old many times - despite us not officially saying anything to her. Again it's like she's picked up on something and it's played on her mind. In the end when we did tell her about Bill, we chose to echo things she'd have been told in school about going to heaven and how our bodies are left behind but the good bits of us, our spirit, our souls, go up to heaven and we stay in here (our heads / memories) and in here (our hearts). She sat quietly for a while and said "That makes me very sad" (at which point I really struggled not to burst into tears in front of my wife and my in-laws who were present). Though there were no more mentions of it during the rest of the evening and before bed, we flagged it with her teacher for today (who gave my wife a huge hug, bless her) and hope for the best. 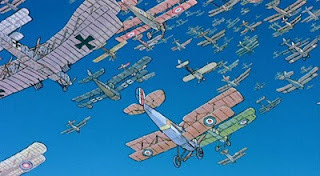 The reason for the header image was because we'd watched a Studio Ghibli film called "Porco Rosso" and there's a sequence in it where Porco is describing "the mother of all dogfights" - and at one point his plane breaks above the clouds and all the phantom planes and pilots of years past are all up there, flying in the clear air, forever more. This obviously stuck in C's mind because she now thinks that con trails are those long lost pilots, and that this is 'heaven' in a sense. That's kinda cute. It's a tough thing to try and broach with a child and there are many children's books and many well meaning folk who have their own theories and advice on how to deal with the situation. I think we did OK. All in all, I feel like I'd much rather Princess C had in her mind something that was reassuring, and emphasised that people live on in our memories long beyond the time of their flesh and bones - and leave their indelible mark on the world in one way or another.